Description & Comments: The Jade Buddha Temple is probably the most famous temple in Shanghai and will be printed on every hotel card destination listing. While the complex is small, it is interesting to wander through and has a number of halls to stop and peek in: Hall of Heavenly Kings, Great Treasure Hall and 10,000 Buddhas Hall. The centerpiece is, of course, the jade Buddha located in its own hall (extra 10rmb entry) at the back of the complex. Totter up the well-worn stairs to have a look at the nearly 5 foot (1.9m) tall pale-green Burmese jade likeness. Description & Comments: While slightly less famous than the Jade Buddha temple, Longhua is the oldest and largest Buddhist temple in Shanghai. The monastery is said to have been founded in the3rdcentury, while the 7-story pagoda (not open to visitors) dates from the 10th century. 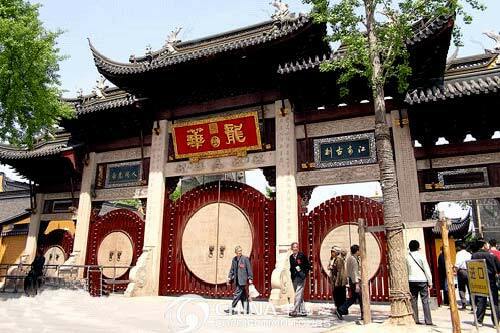 There are five main halls to wander through, the most interesting being the Thousand Luohan Hall where hundreds of golden statues of arhats (arhats or Luohan are Buddhist saints, disciples of Buddhism who are said to have gained enlightenment). Visit during the Longhua Temple Fair (3rd day of the 3rd lunar month, early May 2008) when hundreds of stalls selling traditional Chinese food and trinkets are set up. Description & Comments: Sitting on one of the busiest roads in Shanghai, Jing'An temple is one of the few you'll probably see before you know what it is. Impressive from the outside with imposing walls, it is actually one of the less interesting inside - but still worth a look. It has a long history, originally built in the 3rd century, it was moved to its present site in the Song Dynasty, destroyed in 1851, rebuilt, turned into a plastics factory during the Cultural Revolution and renovated back into a temple in 1983. It is undergoing constant renovation but its Song Dynasty architecture is beautiful and the temple is popular with tourists and practicing Buddhists alike. Description & Comments: All Chinese towns traditionally had a Daoist temple dedicated to the town god. Shanghai's dates from 1403 though the current building site is new, constructed in the 1990s. The town god, the Míng Dynasty emperor Hóngwu's likeness is in the rear hall. A visit to this small but interesting temple is easy to add on to a visit to the Old Town, where the Yu Gardens and Bazaar are located. Description & Comments: The temple is located on a small pedestrian street so your taxi driver might stop and just jerk a finger in the direction of this sedate temple. The street vendors outside selling everything from giant stuffed animals to squid-on-a-stick offers an interesting juxtaposition to the refined gardens and quiet temple complex. Within the compound, there's a large statue of Confucius outside the Dacheng Hall. You can view bizarre-shaped stones and wood (tree roots) in several of the other halls but don't miss the Kuixing Pavilion in the western part of the compound. The stark gardens are well-maintained and relatively un-touristed offering a lovely respite. putuosan itu di shanghai ka?